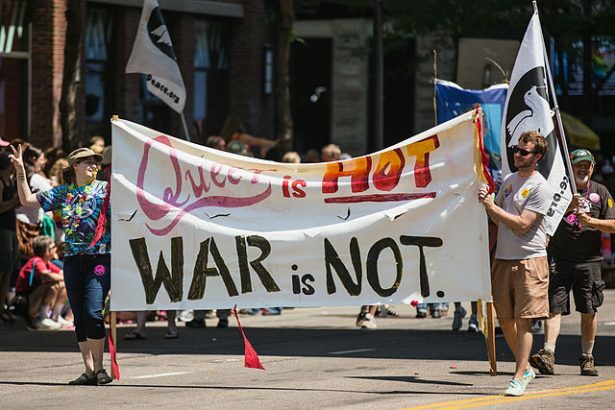 A network of queer anti-war activists are working to undo the mainstream narrative that representation within the military and CIA matters more than the lives of people lost through U.S. aggression. They won’t be the first queers to take up the anti-war cause. Deeg Gold is a longtime activist with the group Lesbians and Gays Against Intervention, or LAGAI, which formed in the Bay Area in the 1980s to combat U.S.-sponsored terror in Latin America. To Gold, the ability to serve in the military isn’t at all the version of liberation they (Gold uses gender-neutral pronouns they and them) were fighting for when they started their activism in the 1970s. Later, during the first Gulf War, LAGAI came out with its “We Like Our Queers Out of Uniform” campaign. Released in the summer of 1992, the campaign’s associated zine contains narratives about queer conscientious objectors and people who joined the military only to regret it later. The group even debated military inclusion on Sally Jessie Raphael’s daytime talk show on NBC. A “We Like Our Queers Out of Uniform” banner showed up at the 1993 March on Washington, and reappeared at various anti-war actions over the years. Members dusted off campaign signs as recently as April 15 in Oakland, for an anti-war rally highlighting U.S. bombing in Syria. People like Gold and Spade are actively working to blow up the idea that representation matters more than the lives of people lost through our country’s acts of aggression. They’re up against LGBTQ groups who have more money and slick public relations teams. The official shirt of the 2018 Lesbians Who Tech conference reads: “Lesbians Who Tech. Queer. Inclusive. Badass.” The shirt does not, however, mention that the conference has been openly sponsored for the last two years by none other than the Central Intelligence Agency. In an email exchange, Lesbians Who Tech founder Leanne Pittsford proudly stated that her group is “the largest LGBTQ technology community in the world, committed to visibility, intersectionality and changing the face of technology.” Pittsford names a real problem: At the same time, the tech industry’s hard-to-penetrate white-and-Asian bro culture has spurred a thousand calls for increasing diversity within Big Tech companies. The popular tech developer website StackOverflow surveys its users each year, including on industry demographics. It found that 85 percent of respondents were white or Asian. More than 92 percent identified as male and more than 93 percent were straight. Under pressure to hire outside these populations, companies are embracing queers across the rainbow spectrum. Plenty of LGBTQ people want a piece of the pie, as the 5,000-strong Lesbians Who Tech conference in San Francisco this year made clear. One of the March gathering’s main speakers was Sandy Adams, a director at the military contractor Raytheon. Adams made her pitch for inclusion in the company’s missile technology program on the stage of the city’s Castro Theater against a backdrop of an enormous American flag — a moment one attendee called “cringe-worthy.” For those seeking to diversify companies that feed the military-industrial complex, the question is whether the quest for fairer labor opportunities can be untangled from the human cost of war. “Homosexuals,” Hillenkoetter said, “are often too stupid to realize it, or through inflation of their ego or through not letting themselves realize the truth, they are usually the center of gossip, rumor, derision, and so forth.” Under Hillenkoetter, the CIA helped to purge hundreds of suspected “perverts” from the U.S. government during what became known as the Lavender Scare of the 1950s. As Deeg Gold mentioned, the CIA has long used covert intervention in U.S. culture as a means to stifle dissent and progressive ideas. Under Hillenkoetter, the CIA created the anti-communist Congress for Cultural Freedom, which eventually had offices in 35 countries and published lifestyle magazines and funded artists to popularize its missions in the United States and abroad. It organized classical and jazz concerts, abstract impression art exhibits, and even employed cultural icons like Louis Armstrong, Jackson Pollock and Gloria Steinem. This excitement would not likely be shared by the dozens of Pakistani transgender people who, in 2012, called for an end to the CIA’s drone strikes in their country. That year, trans people held a public protest against the growing number of deadly drone strikes by the Obama administration, which resulted in hundreds of civilian deaths. 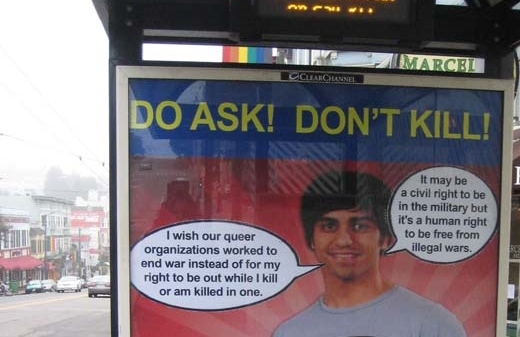 The Pakistani trans group, led by a trans woman named Sanam Fakir, made it clear that queer and trans people overseas were being killed by the same U.S. agencies that were holding Gay Pride parties back on American soil. Speaking about the CIA’s program to recruit queers that began a decade ago, Gold called the “progressive” hiring campaign similar to a pro-gay public relations campaign funded by the Israeli government. “It’s just like the Zionist-Israeli tactic of pinkwashing [or the use of liberal-leaning policies on sexuality to cover up violence and terror],” they said. “It’s almost as if they hired the same consultant.” Queer Palestinian groups such as ASWAT – Palestinian Gay Women have openly opposed U.S. complicity in the violence. Israel receives more than $3 billion in U.S. military aid each year. One of the CIA’s major contractors is Google, which provides the agency with drone technology. Meanwhile, it has attempted to counteract the flak it has gotten for a lack of diversity among its staff through major sponsorships for Lesbians Who Tech and San Francisco Gay Pride, the world’s largest gay event. Google’s most famous intracompany slogan may be “Don’t be evil,” but it and many of the world’s largest tech companies can’t get around the fact that they’ve been part of the U.S. war machine for many years. That is why the work of queer anti-war organizers is so vital. Activists like Gold and Spade believe we could all stand to remember the ideological work of earlier queer struggles instead of the CIA or corporations. For example, the 1969 queer uprisings against police brutality at the Stonewall Inn in New York City (or the less-celebrated, earlier riots at Cooper’s Donuts in Los Angeles and Compton’s Cafeteria in San Francisco), considered by many to be the sparks that lit the modern gay liberation movement. Or the organizing in the 1980s and 1990s against the government and Big Pharma companies who refused to act on HIV/AIDS. Or the unrelenting voices of trans women of color like Miss Major Griffin-Gracy, Marsha P. Johnson, and Sylvia Rivera, who demanded the microphone when gay and lesbian groups refused to speak on transgender issues.